We had a massive number of people show up to our AGM! 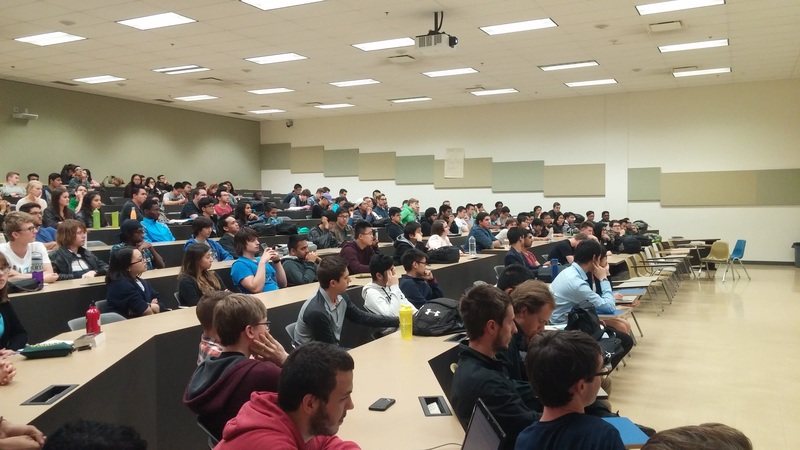 This was our most successful AGM ever with enough people to almost completely fill a big lecture hall in ETLC. Thank you to everybody who came. We hope you join our team and learn valuable skills while building the most fuel-efficient vehicles in the world. If you weren’t able to make it, don’t fret. You can still get involved. Come out to our Ecolympics event on Sunday, October 2nd and again on Saturday, October 8th from 13:00 to 16:00. This is our main event geared at new recruits and is designed to give you a hands-on introduction to EcoCar in a competitive environment. You can either go to the Electrical Ecolympics or the Mechanical one (or both on the two different days) as per your proclivity. Sign up using this form. We will also have a team meeting at 11:30 on Sunday, October 2nd for returning team members but new recruits are welcome to attend. Otherwise, keep an eye on your inboxes for emails from EcoCar. If you aren’t on our mailing list yet, message us on facebook! Previous PostPrevious Check Out Our Latest Videos! Next PostNext ALICE goes to Telus World of Science!